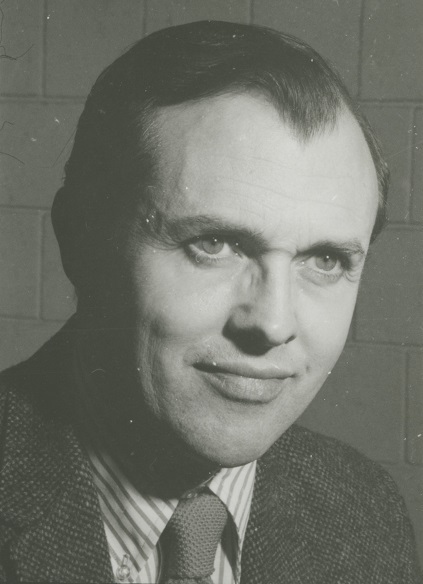 In early 1966 top OU administrators contacted renowned director John Fernald, Head of the Royal Academy of Dramatic Art in London. They wanted to establish a professional resident company on campus and at the same time open an Academy of Dramatic Art (ADA). Like the Meadow Brook School of Music, which relied on artists from the Meadow Brook Music Festival to offer quality instruction to students, the ADA would give students a unique opportunity to learn from profession. 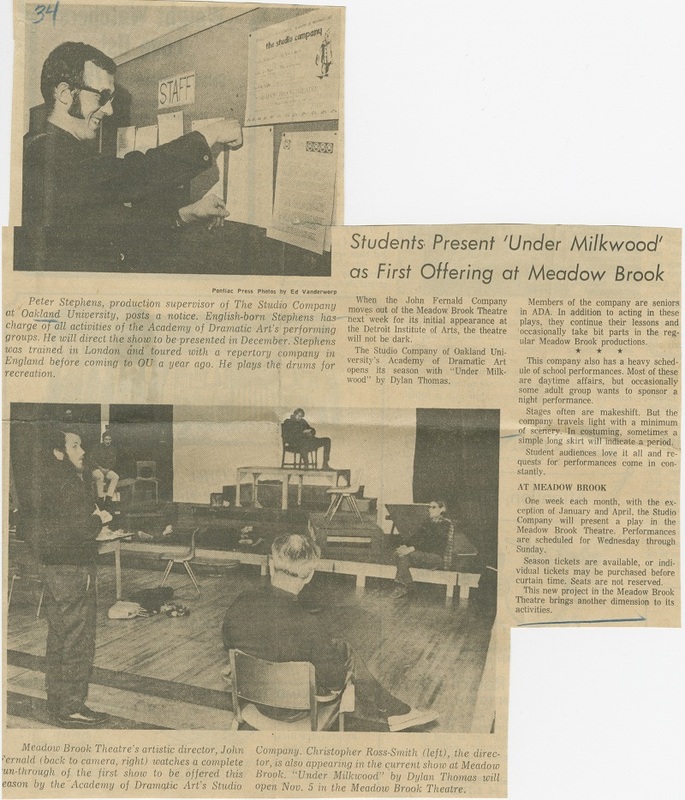 Fernald accepted OU’s offer and in July 1966, the professional theater company -- Meadow Brook Theatre -- was officially launched, with the first season starting in January 1967. The Academy of Dramatic Art opened in the fall of the same year under the direction of Fernald. While plans for a new performing arts building - the future Varner Hall - started, the ADA found temporary quarters in the lower level of the Sports and Recreation building. In fall 1967 the Academy enrolled 13 students. 10 more were enrolled in the winter semester, and 9 more in the spring. The ADA greatly benefited from Fernald’s worldwide reputation. He used his extensive network to reach out to actors, directors and other theatre professionals. 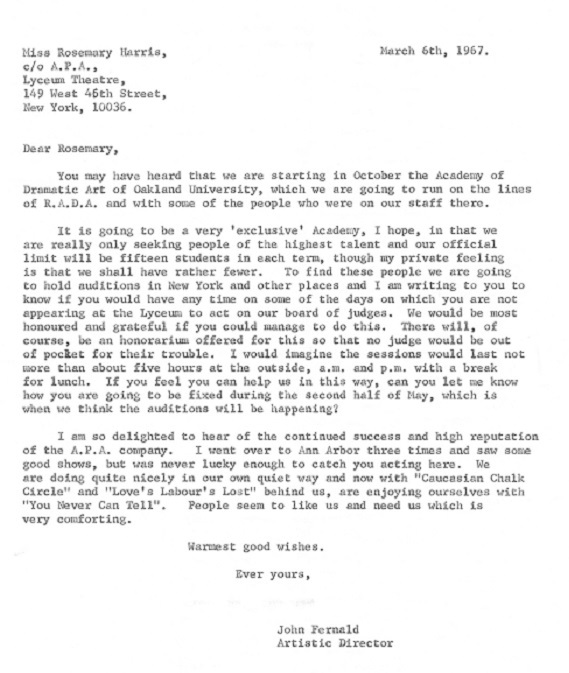 In this letter Fernald invites his friend Rosemary Harris, a well-known English actress, asking her to be a judge for the auditions recruiting students. Harris had just won a Tony Award for her performance as Eleanor of Aquitaine in A Lion in Winter on Broadway in 1966. She and her husband had created their own producing company, Association of Producing Artist . 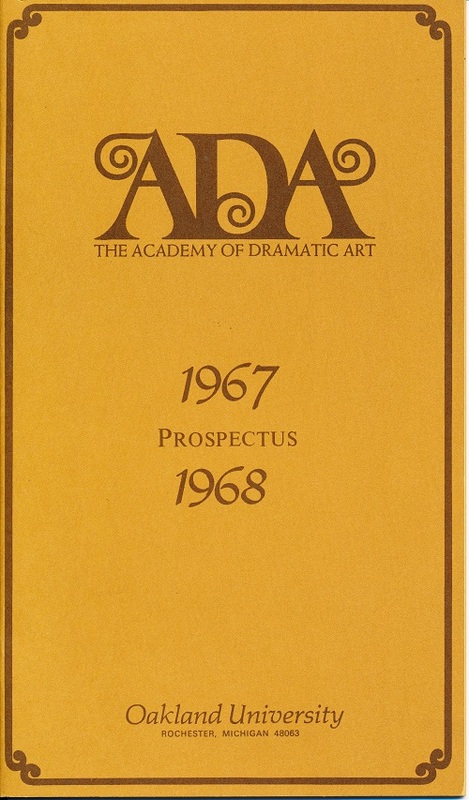 From 1967 to 1977, when the program was discontinued, the Academy of Dramatic Art graduated 116 students and produced 52 plays. Students who passed the rigorous auditions were in for a demanding 2 years’ training. 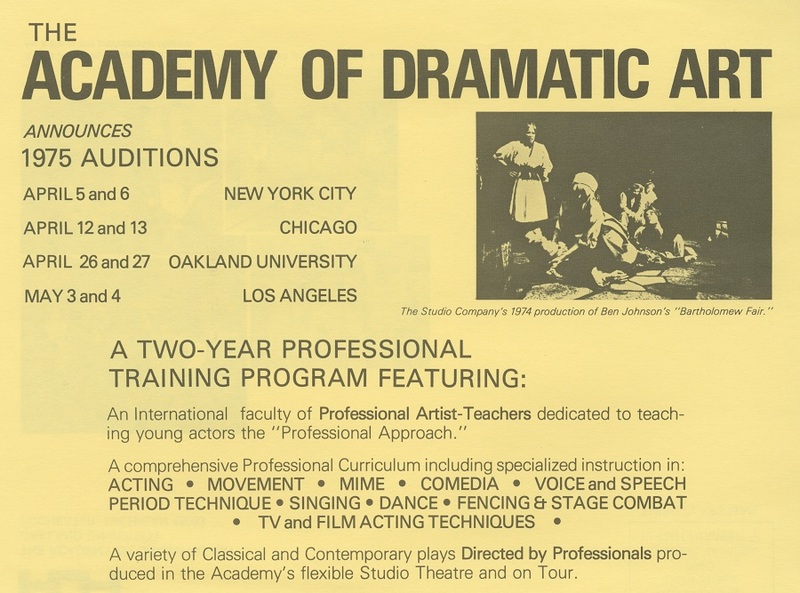 The curriculum for the Diploma in Dramatic Art was “modeled after that of an English acting conservatory”, with classes running 8 hours per day, 5 days a week, with instruction in voice, movement and acting techniques. In the second year, students had opportunities to polish these skills in public performances through the Studio Company. The initial calendar included 3 11-week terms per academic year. In 1970 they switched to 2 semesters. All courses were prescribed. Attrition was high because the program was very selective. But the Academy boasted small class sizes and one-on-one attention, and students praised the quality of the training. 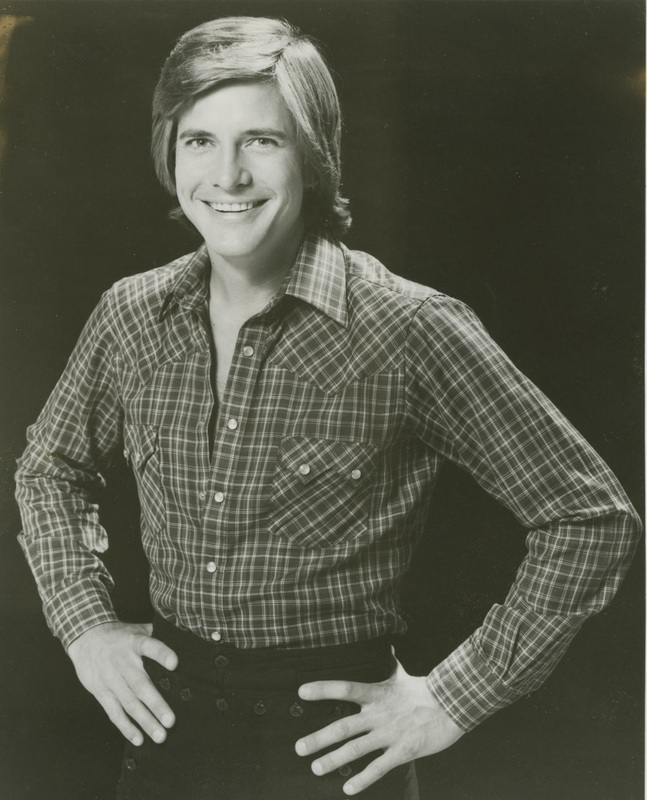 Dirk Benedict, a successful actor on Broadway and in Hollywood, later said that the foundational training he got at the ADA was “invaluable” and “fantastic”, giving him the confidence he needed as a performer. The program was not part of OU’s academic offerings, and ADA credits were not transferable to OU credits. However in 1971-1972 the ADA started offering credit courses in the theater, open to OU students: UC045 Introduction to the Theatre, and UC009C Theatre in America Today. Both had enrollment in the hundreds. In collaboration with the School of Education they also offered a course Play Production for Secondary School Teachers. Students were recruited nationally through auditions. The Charter Class were selected at auditions in New York, and Chicago as well as on the OU campus, but later on auditions were also held on the West Coast. In the first few years, 70% of students came from out of state - a percentage that declined to less than a quarter by 1975-1976. The vast majority were mature students: they already had some college experience, and ages ranged from 20 to 23. These students came to OU because they wanted more than the theatre programs at other colleges, which had less emphasis on professional training, and they were not deterred by the challenging job prospects in the acting profession. The presence of the Meadow Brook Theatre was a huge draw, and some graduates went on to work there. The original staff and faculty all came from the United Kingdom, as all but one had previously been employed by Fernald. John Broome, for example, had been a choreographer of the Old Vic Theatre in England before joining the ADA as lecturer in movement. 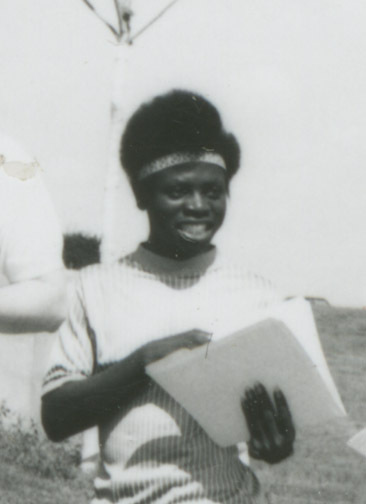 Other instructors were later hired, such as Terence E. Kilburn who came to the ADA in October 1969 as a teacher and actor and director in residence. Kilburn had an early career as a child actor playing Tiny Tim in the original Christmas Carol movie, and had been in many other movies and plays before coming to OU. 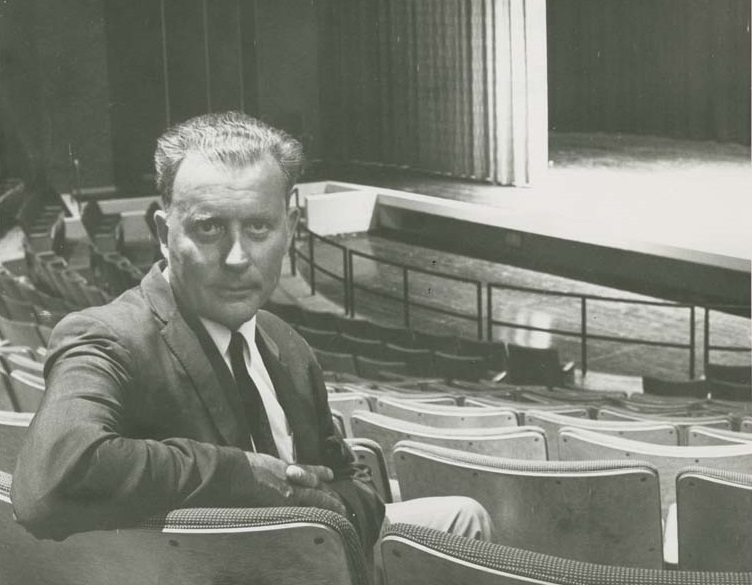 Upon Fernald’s departure in 1970 he would become Artistic Director of the ADA and Meadow Brook Theatre. 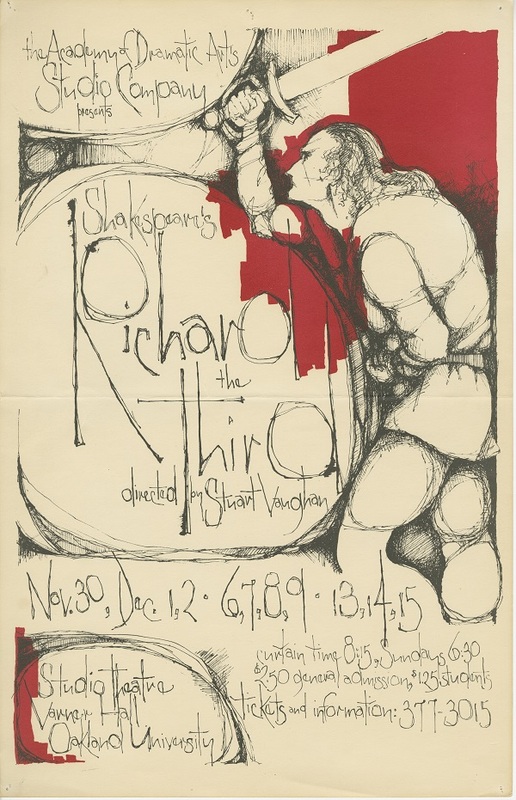 Stuart Vaughan, an internationally known director, playwright and author, came to the ADA to direct the production of Richard III in 1973-1974. Several members of the neighboring Stratford Festival Theatre Company of Canada also visited the Academy. 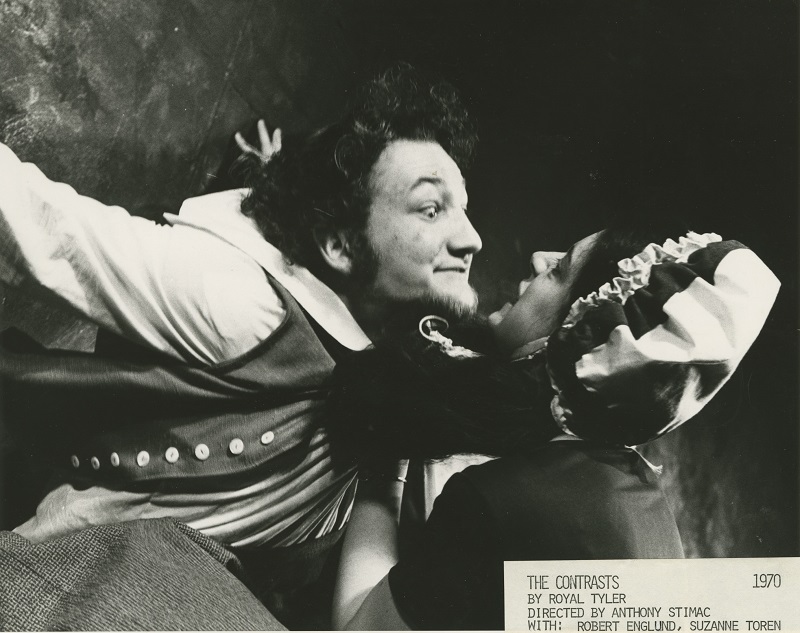 From 1967 to 1977, the ADA employed 62 teachers in acting, voice, and speech, dance, movement and mime, commedia, text and interpretation, period technique, singing, fencing and stage combat, and makeup. Between 1968 and 1976, the Studio Company produced 52 plays and toured some of them to 60 different secondary schools. The first productions were presented during the summer of 1968 in the F.A. Bower Theater in Flint. 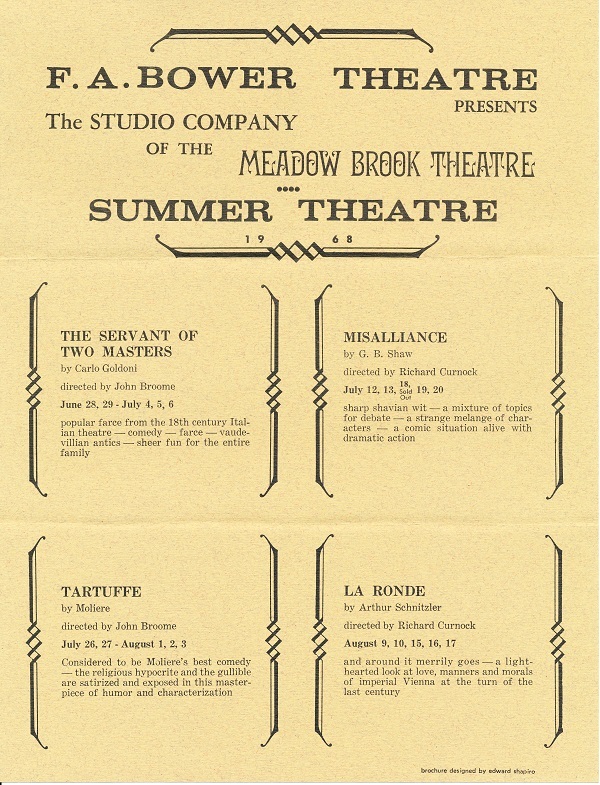 The first productions on campus were in the lower level of the Sports and Recreation building, but during the 1969-70 season, the Studio Company was able to present plays in the Meadow Brook Theatre while its resident company performed at the Detroit Institute of Art. This newspaper clipping from the Pontiac Press announces rehearsals for the Studio Company's first production at Meadow Brook Theatre - Dylan Thomas' Under Milk Wood. Below, students are rehearsing for the production. 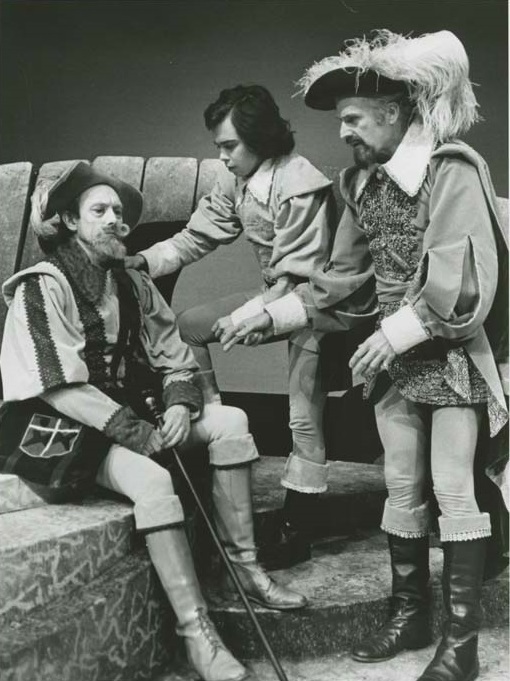 In fall 1970 the Studio Company was finally able to occupy dedicated space in Varner Hall and began producing plays in the Studio Theatre. Many guest artists directed Studio Company productions, like Stuart Vaughan for Richard III. This helped students operate in a near-professional setting. The ADA thrived in in the first few years, especially after finding a home in Varner Hall and the Studio Theatre. After Fernald left in 1970 Jerry L. Dahlmann became Administrative Director and Kilburn became Acting Artistic Director for both the Meadow Brook Theatre and the Academy. In 1972 he took the position of Associate Dean of the School of Performing Arts, and soon after that Alfred Ruscio became artistic director of the ADA. However the ADA faced serious challenges. In the final years, lack of fund for invited faculty and AAUP contract guidelines led to reliance on full time faculty rather professionals on temporary basis. The Meadow Brook Theatre no longer had a resident company, which also limited the availability of professionals who could be part-time instructors. To properly train actors requires a number of professionals working with small groups of students, and even one-on-one. Such high quality training was very expensive. The program also struggled to recruit new talented students, in part because it did not offer sufficient financial aid but also because the ADA diploma became less attractive compared to theatre degree programs. After a thorough review in 1976 the decision was made to discontinue the program. In the decade of its existence the ADA produced a number of successful alumni. About 20% of graduates earned their living in the professional theater in 1976, and maybe half were still actively pursuing professional careers. This was quite an achievement, considering the limited employment prospects for actors. The most successful were probably the early graduates. A June 1969 graduate, by 1972 Benedict was already playing leading roles on Broadway productions, such as Abelard and Heloise and Butterflies Are Free. He was also starring in a feature film, Georgia, Georgia. A 1974 graduate, Armstrong is a successful actor who appeared in Risky Business and starred in the Revenge of the Nerds as well as numerous TV series like Moonlighting. 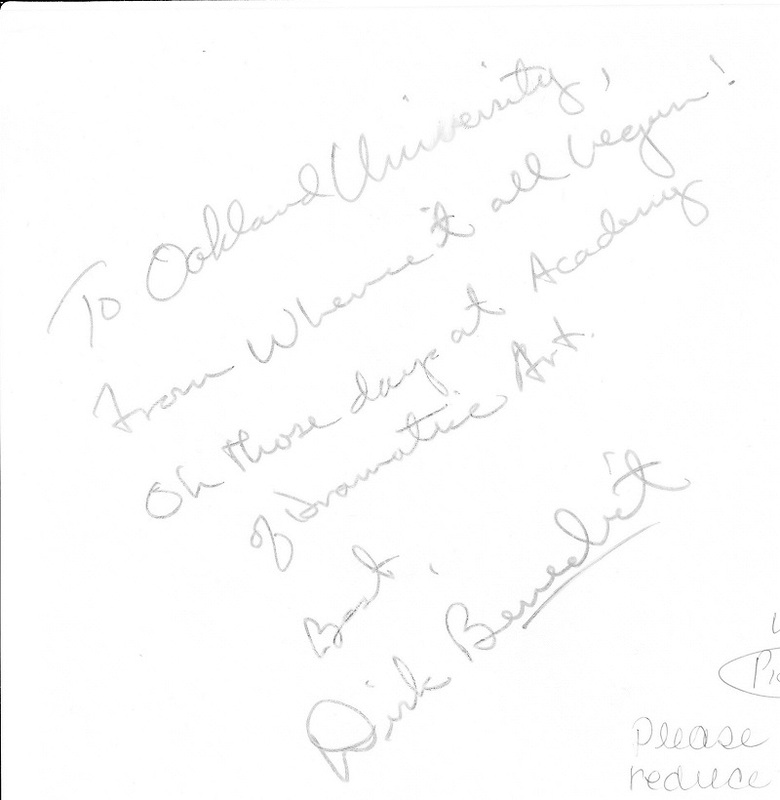 He came back to OU to appear in Meadow Brook Theatre’s Present Laughter in 1986. He is shown here in the Studio Company's production of The Tempest. Best known for his role as Freddy Krueger in the Nightmare on Elm Street series, Englund has appeared in dozens of films and TV series. In 1973 he returned to the Academy of Dramatic Art to teach a stunts and stage fight class and also appearing at the Meadow Brook Theatre. 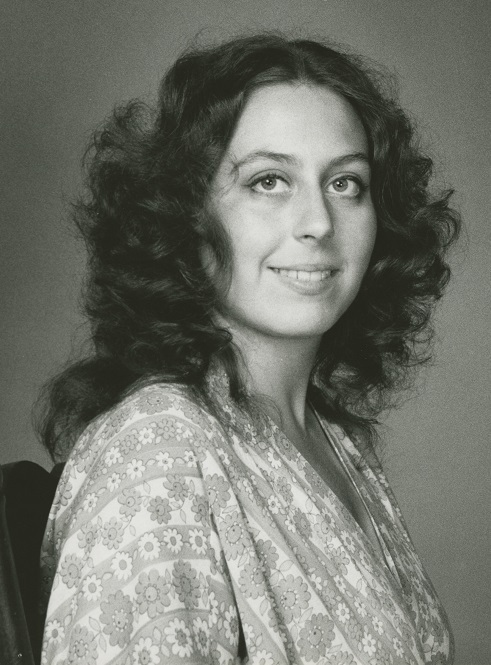 A 1974 graduate and award-winning actress, she continued to appear in Meadow Brook Theatre plays in the 1980s and early 1990s. She won multiple Tony Award nominations starting in 2006, and won the 2016 Tony Award for Best Performance by an Actress in a Featured Role in a Play for her role in The Humans. The first ADA African American graduate (1971), he directed "The sty of the BIind Pig," a play by former Pontiac writer PhiIlip Hayes Dean at the Ujamaa Theatre of Pontiac in 1974. The play, in which Dean had explored his own experience as a black man and the sociology of black communities, was later quite successful Off Broadway. Glenn would go on to a successful acting and directing career.